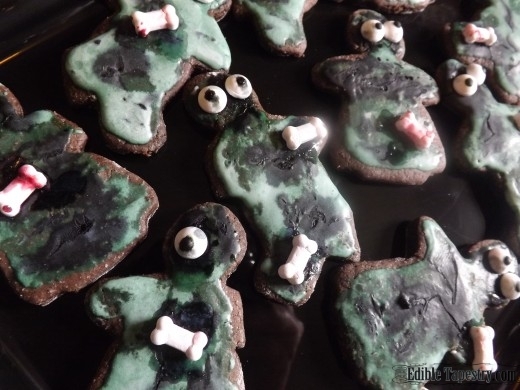 Zombiefest with The Walking Dead Season 5 Premiere ~ Chocolate Mint Zombie Cookies Recipe! 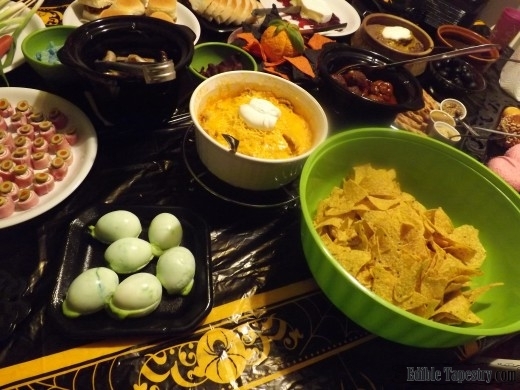 Last year we called it Creepfest ’13, but since earlier in the year we centered a family vacation around touring film locations for The Walking Dead television series, we timed the annual ghoulish buffet my husband and I put on for our kids with the premiere of The Walking Dead’s new season. No matter what we call it, my family and I always have a blast. My husband and I work all day in the kitchen to make our creations while keeping the menu and decorations a surprise from our teen boys. When we call them to the buffet table, it’s kind of like a sick and twisted Christmas morning. This year’s food choices were just as “sick and twisted” as previous menu items, but since it was centered around The Walking Dead, we added some fun dishes, reminiscent of foraged and scavenged foods the survivors in the show may have had to eat to keep up their strength for fighting walkers. 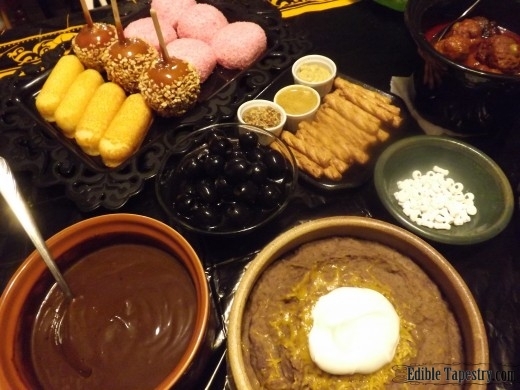 And, of course, we had to include a bowl of chocolate pudding in honor of Carl. Marshmallow Snowballs were “brains”, and my fellow Zombieland fans will understand why Twinkies were a must-have. Refried beans look like dog food to me, so I made a bean dip by mixing pureed black beans and pintos together to simulate the dog food that the survivors in The Walking Dead were planning to eat early in the series, before Rick put a stop to it. 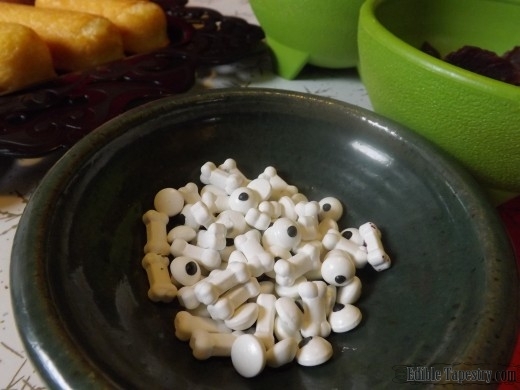 Extra bones and eyes candies that were left over from making our zombie cookies added to the theme when placed in a moldy zombie hued bowl. Black olives for putting on the ends of fingers to make “monster eyes” were required, as always. Caramel apples, an afterthought when I grabbed them ready-made at the grocery store, were included in the menu because they are fun and autumnal, but, unfortunately, went into the compost bin when we remembered too late that none of us like caramel apples very much. 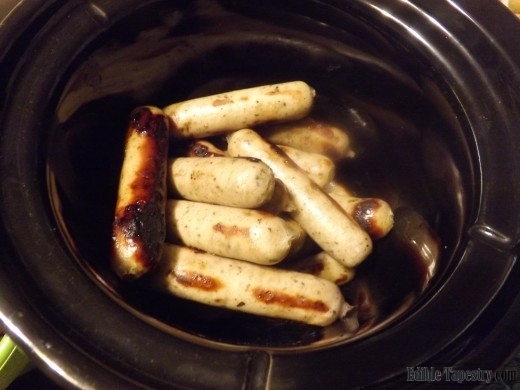 Honey wheat pretzel sticks with three kinds of mustard –whole grain, brown spicy, and honey– looked finger-esque, as did the grilled Nüremburg bratwurst that I piled into a black crock. They were delicious dipped in the mustard trio and can be sometimes found at ALDI supermarkets. I suppose breakfast sausage links would have worked just as well. I was inspired by the brie coffin I saw at Kathleen’s Confections to carve my own. 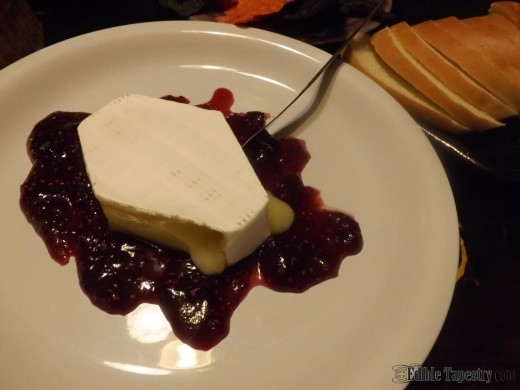 My round of brie wasn’t “quilted”, which detracted from the charm of the original, but it looked extra creepy with a smear of warmed raspberry jam beneath it to simulate congealed gore. 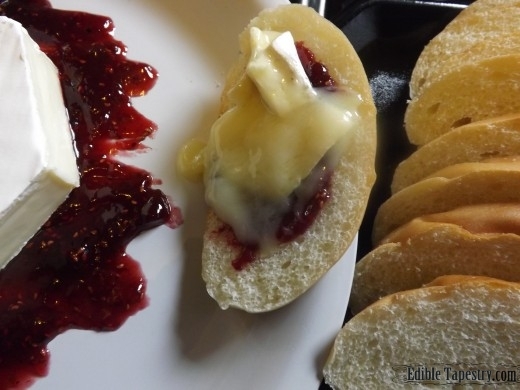 Just before serving with slices of French bread, I placed the entire plate in the microwave to soften up the brie so it would be warm and creamy for spreading. I was certain going into Season 5, that Beth had been abducted by the loons of Terminus and eaten, maybe even by her sister, Maggie, when she first arrived at the “sanctuary”. 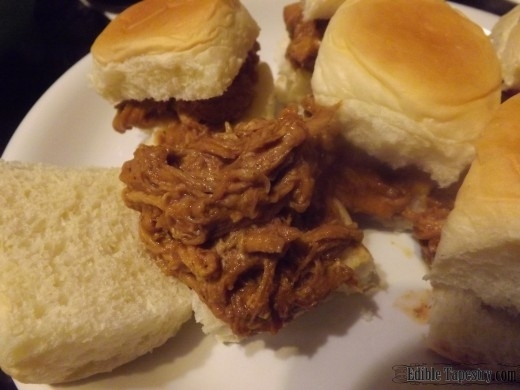 So of course, I had to make pulled pork barbecue sandwiches and call them “Bethbeque” sandwiches for our buffet. Yes. Ew. But little did I know before watching Episode 2 of Season 5 that “Bob-b-que” sandwiches would have been a more appropriate label. Two days later I’m still reeling from that shocker. And a little nauseated by the images of him staked near a roaring fire. And kind of wishing I’d left barbeque out of my Zombiefest altogether. Even fictional reality deserves a little political correctness. Honestly, I’m kind of ashamed of myself. Poor, poor Bob. Poor Beth, wherever she is. But these were GOOD on soft, fluffy King’s Hawaiian rolls. 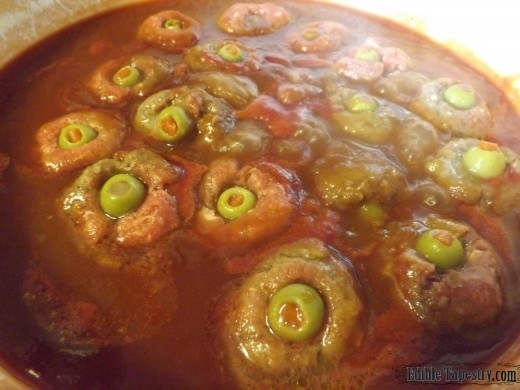 Ham and cream cheese rolls with sliced green olives with their pimiento centers became “eyes”, as did sweet and sour meatballs stuffed with whole green olives. The Rotten Robin Eggs I thought up when I was imagining foraged/scavenged food. I’m sure, however, that the toxins a survivor would ingest by eating the real thing in the wild would be enough to do them in, without the help of a walker horde. My edible version of spoiled eggs was made from blue/green dyed deviled eggs with the halves put back together and a little dyed filling oozing out. Yuck! Perfect. I will list the instructions on how to make them in another blog post. 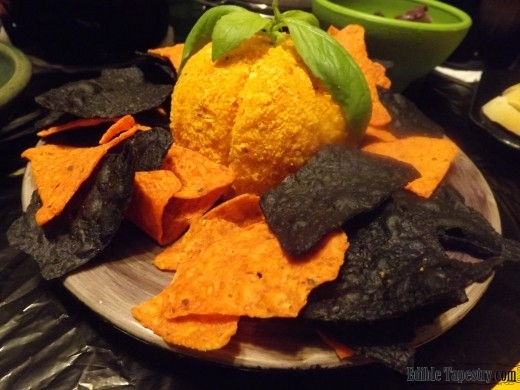 My pumpkin cheese ball, rolled in nacho tortilla crumbs, looked adorable with a basil leaf stem, surrounded by black and orange tortilla chips. A bamboo skewer worked wonders when it came time to add the ridges of the pumpkin. I’ll share my simple recipe in another post. 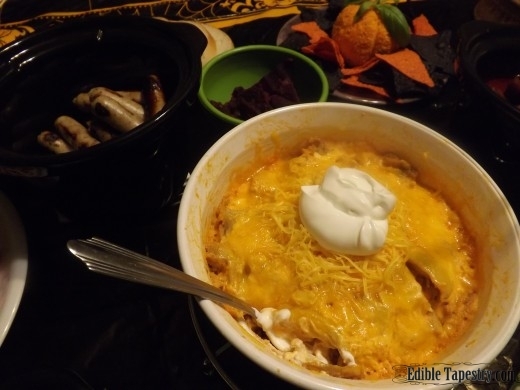 Because it has become a tradition, I included my husband’s favorite creep-themed dish, Buffalo chicken dip, in the menu. Nothing scary about it but the amount of fat it contains. 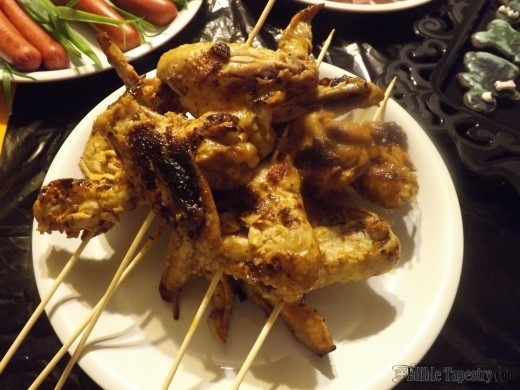 Wings marinated overnight in salt, pepper, and hot sauce, then pan seared before being brazed in more hot sauce and a little water ended up looking like wild birds roasted on sticks over an open fire, as I’d intended. They were my favorite dish of the evening, so much so that I think I will make wings using this method from now on. So much tastier than fried or baked hot wings! 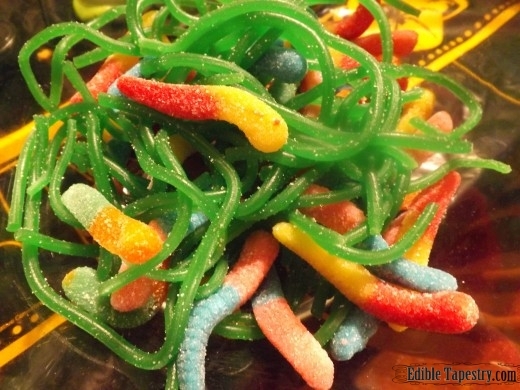 Blue and green Sour Patch Kids made good walkers, biters, and zombies served in a dish next to a bowl of worms; sour worms with pulled apart, green apple flavored Pull ‘n’ Peel Twizzlers. 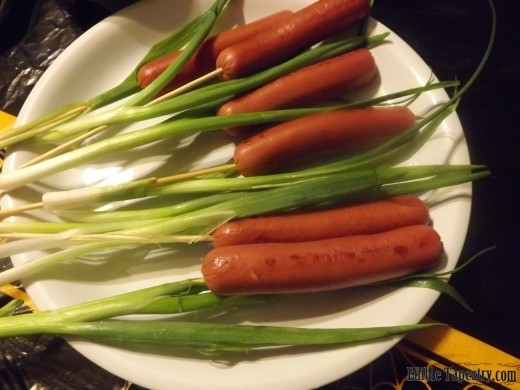 With foraging in mind, I made a tray of hot dog/green onion cat tails. I just trimmed the root ends of green onion stalks, then cut the green ends at an angle before threading them onto long bamboo skewers. I warmed the hot dogs up at the same time I grilled the bratwurst, then slid them down the ends of the skewers. Fun! The boys loved them. 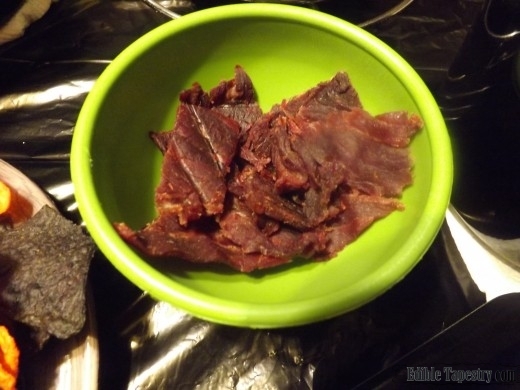 An icky green bowl of beef jerky made good edible “skin”. 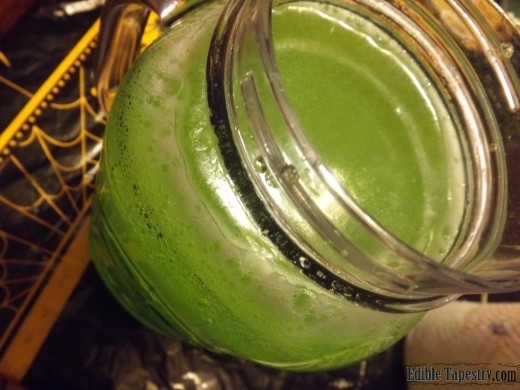 My pitcher of “Eugene’s Antidote” was green Kool-Aid with Sierra Mist added to make it fizzy. 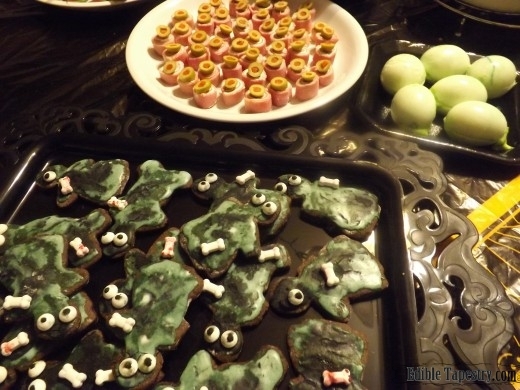 The so-ugly-they’re-cute zombie cookies looked amazing on the table with our other creepy foods. Candy eyes and “bloody” bones zombie baking decorations. I found mine at ALDI. To make the cookies, I just creamed the butter and sugar in my stand mixer, then beat in all the other ingredients. So easy. 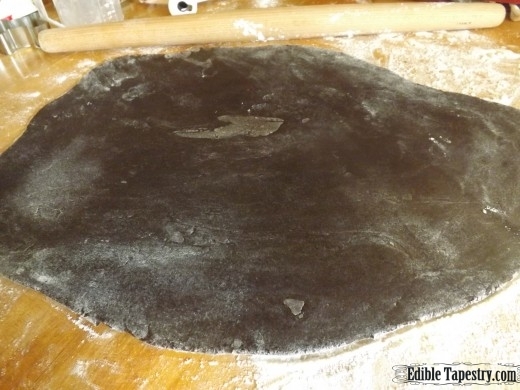 Then I chilled the dough to stiffen it up for rolling. 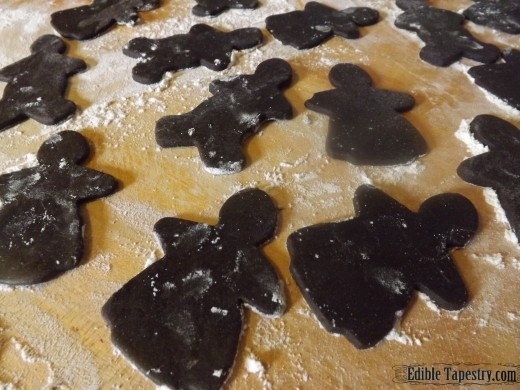 To cut out the little zombies, roll the dough out on floured surface. 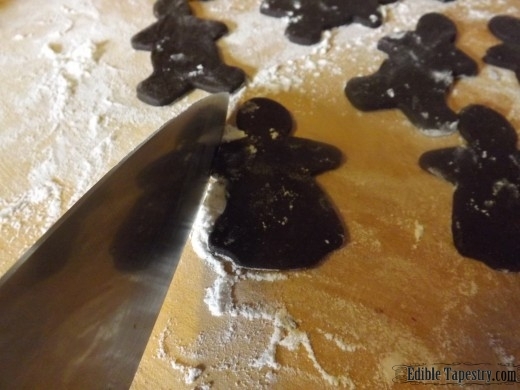 The thinner the dough, the crispier the cookies will be. Mine was around an 1/8″ thick. 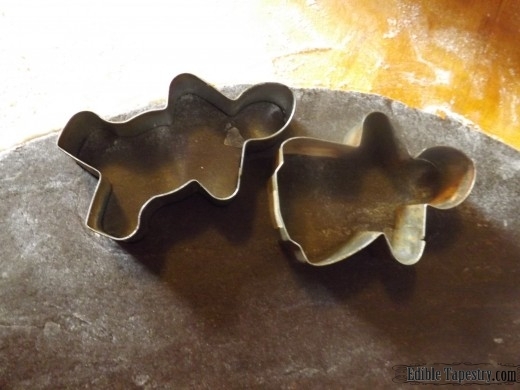 Using a gingerbread man and woman cookie cutter, cut out zombie people. Then have fun lopping parts of them off with a knife. Ick. Place on a sheet pan and bake at 350 degrees F. for around 7 minutes, longer for crispier cookies. 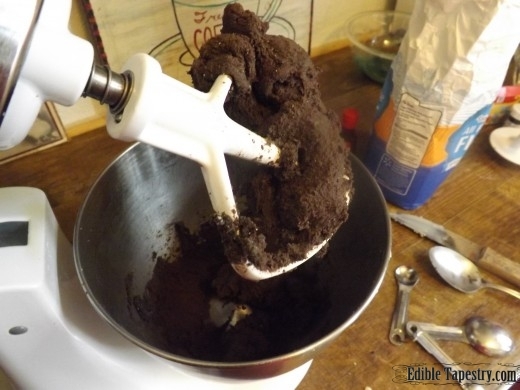 Add green and brown food color and peppermint extract to the confectioner’s sugar to make the icing, drizzling in a miniscule amount of water as you go to make a thick icing that can be spread on the cookies. 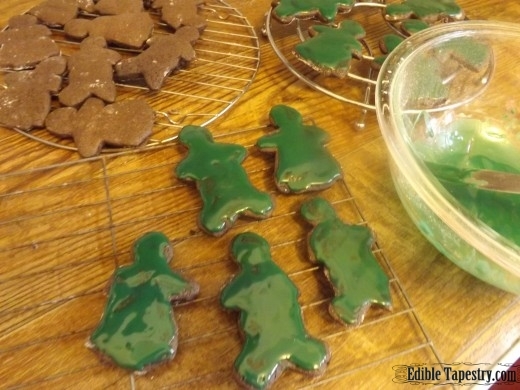 When they are completely cool, coat the surface of each one with the greenish icing. Using a toothpick, streak each with black gel food color to yucky them up. You’re going for aged, decayed, and moldy. Randomly add the eyes and bones. This was my husband’s job and I think he really loved it. I cracked up when I saw that some only had one eye, for a realistic touch. We ended up eating very late under Halloween green strings of lights, while watching The Walking Dead, and had so much food left over that much of it was packed into the freezer. But what fun it was, cooking with my husband, surprising the boys with our latest creepy food ideas, and carrying on a silly tradition that I hope none of us will ever forget. « Indian Paneer ~ Homemade Cheese in Minutes!